Ready in 10 minutes, this sauteed kale with bacon is savory and delicious. 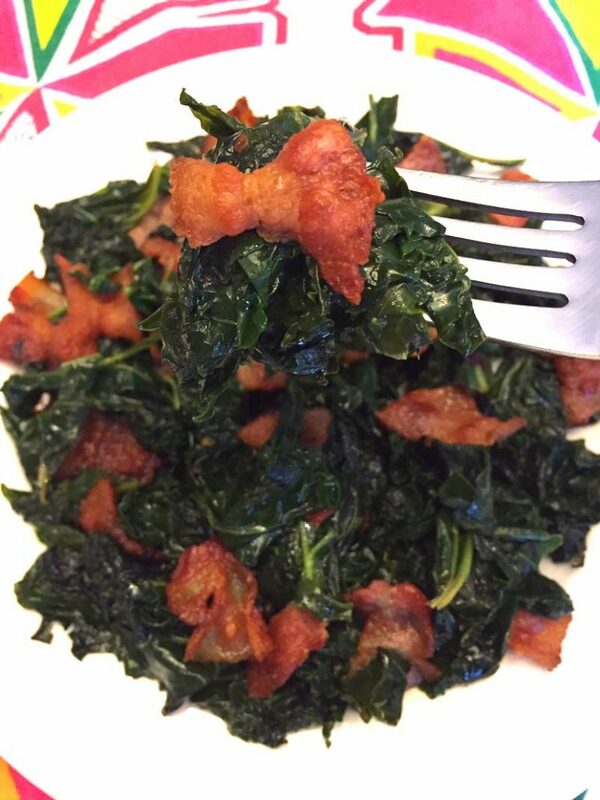 If you are looking for a new way to prepare kale (and enjoy some bacon) this recipe is for you! You’ll be in love this delicious recipe, so get ready for it to be in frequent rotation in your kitchen! If you think “kale” and “delicious” don’t belong in the same sentence, think again. 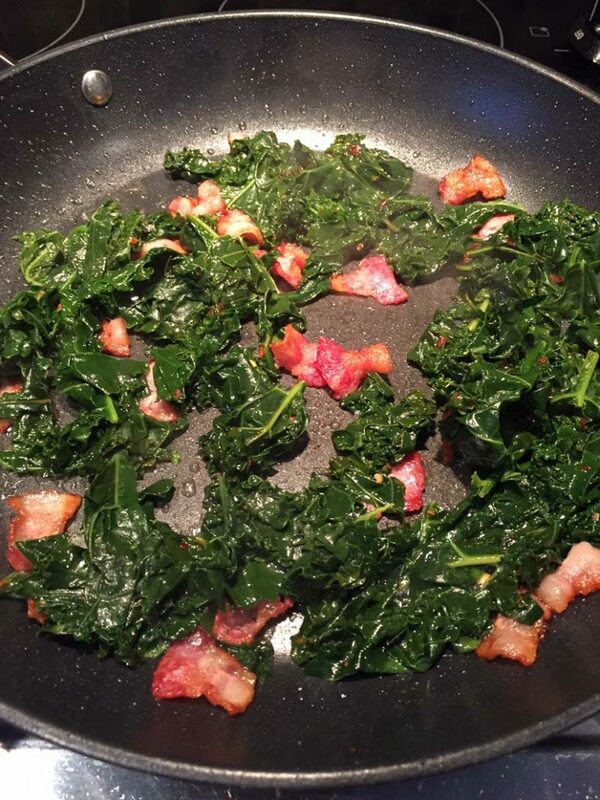 One bite of this delicious sauteed kale and bacon recipe and you will be sold on kale. Don’t be surprised if it becomes your new favorite green when prepared this way! 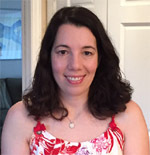 You’ve probably seen kale on magazine covers or heard about how it is a superfood. When cooked, kale is a great source of iron and it is a great source of fiber. If you’ve thought about trying this dark green veggie, here is the perfect opportunity to give it a try. 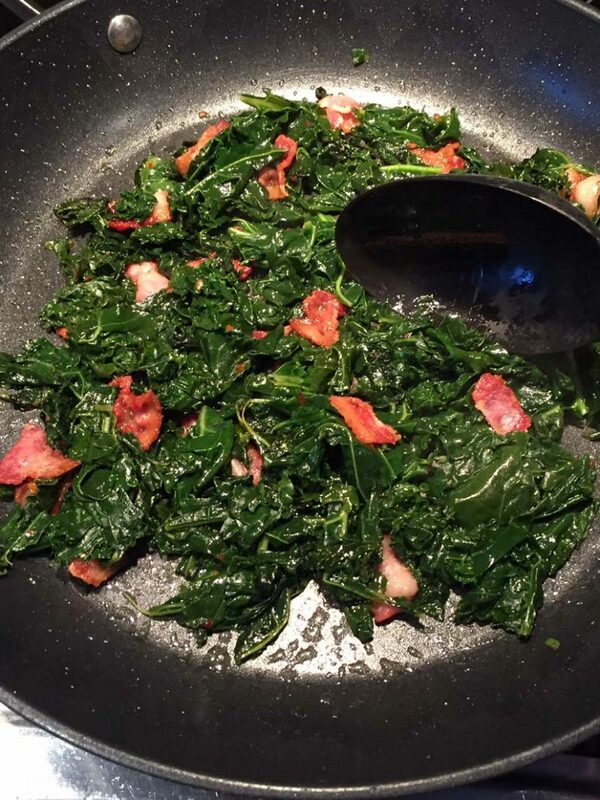 Full of nutrients, this sauteed kale with bacon is perfect for low-carb and keto diets. Even if you aren’t following one of these eating plans, you’ll love the rich flavor of this tasty dish. I’m obsessed in love with the flavor combination achieved in this recipe. 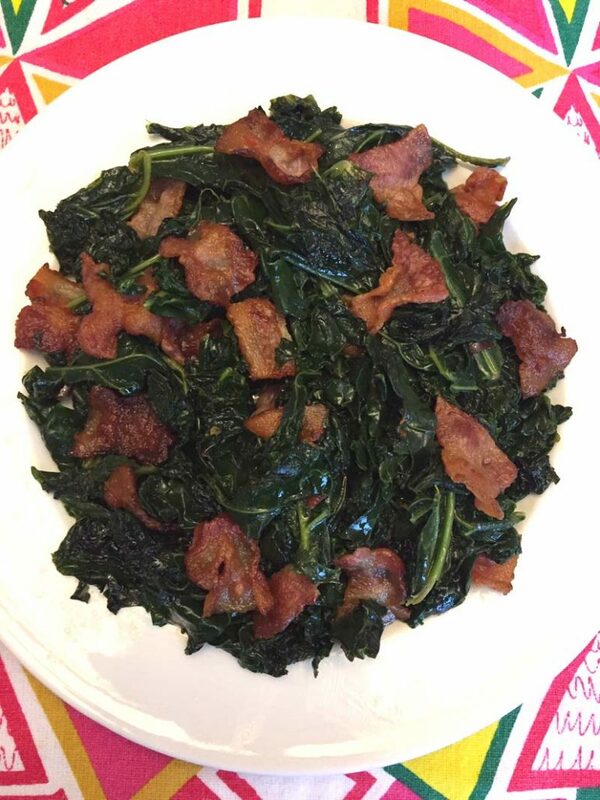 This recipe includes delicious garlic, scrumptious bacon, and perfectly cooked kale. Taking only two minutes of prep time and eight minutes in total, this sauteed kale with bacon recipe is not one to be missed! 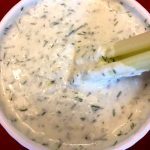 It is a perfect side dish that will have your savoring each and every bite. This recipe is so simple and fast. 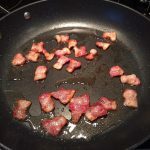 After cutting your bacon slices into pieces, you’ll place them in a non-stick pan for three minutes on medium-high heat. A tip to make life easier, use kitchen scissors to cut up your bacon. After cooking for three minutes, flip your bacon over and cook for another two minutes. While your bacon is cooking, wash your kale and remove the stems. Give the leaves a coarse chop or tear them into pieces away from the stems. When the bacon is done cooking, add in the chopped kale and minced garlic. Give your ingredients a mix and cook, stirring every thirty seconds. You’re going to cook your kale until it is wilted and cooked through, typically about give minutes. 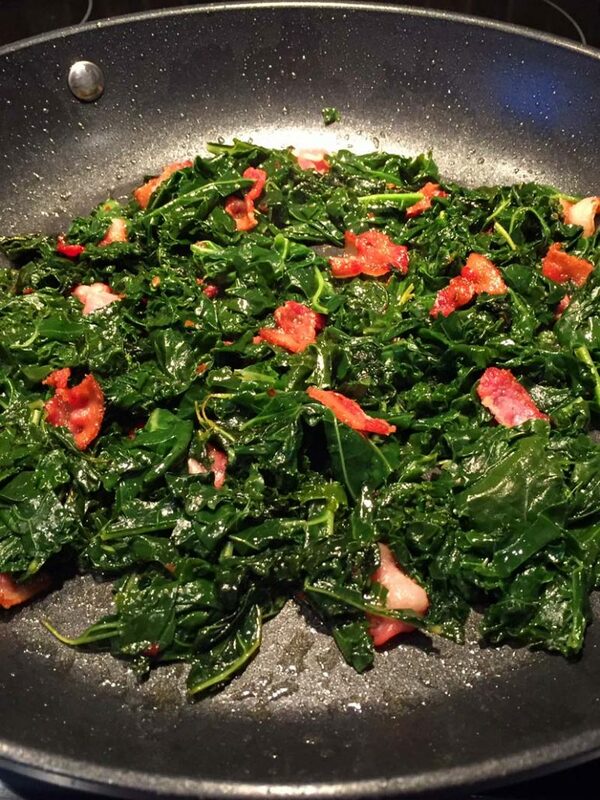 Add some salt and pepper to taste and your sauteed kale with bacon is ready to enjoy. 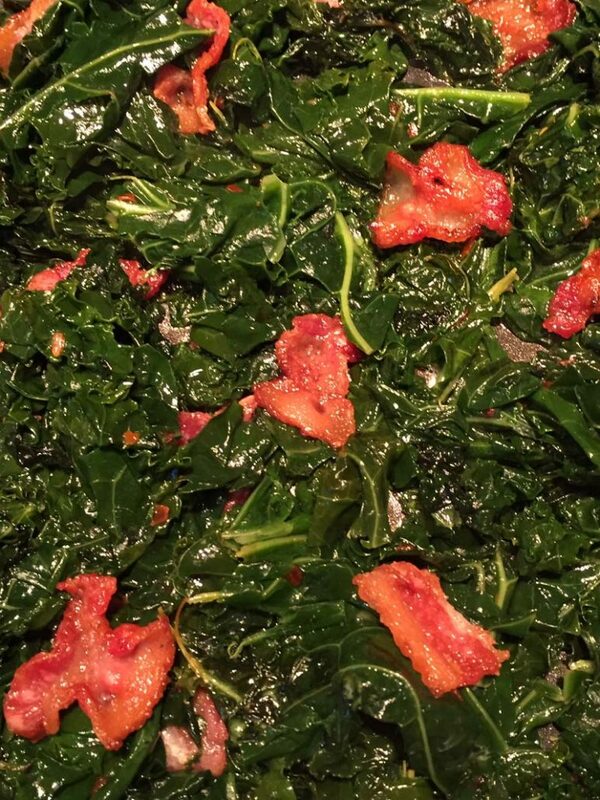 You can’t beat the delicious flavor explosion of this sauteed kale with bacon. Savory and rich in flavor, this recipe is mouthwatering. You’ll love the combination of bacon and kale. Whether you are new to kale or a kale pro, this recipe is not one to miss. 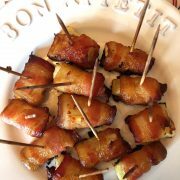 Bacon-Wrapped Asparagus – this is a perfect low-carb appetizer, so elegant and delicious! Instant Pot Kale – if you own an Instant Pot, you will love cooking kale in it! So easy! 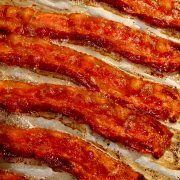 Oven Baked Bacon – this is the easiest way of cooking bacon ever! 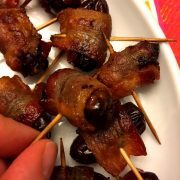 Just put it in the oven and take out delicious crunchy bacon strips! 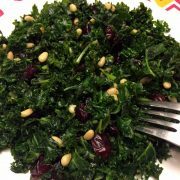 Kale Salad With Cranberries And Pine Nuts – this kale salad is so colorful and festive! This is my favorite kale salad! 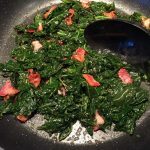 This sauteed kale with bacon is amazing! 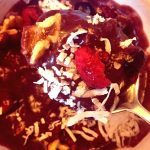 Perfect for keto and low-carb diet! Ready in 10 minutes! So easy to make, yummy and filling! Cut each bacon slice into 4 pieces (the easiest way to do it is using scissors). Put bacon pieces on a large non-stick frying pan and cook on medium-high heat for 3 minutes. Flip the bacon pieces and cook for another 2 minutes. 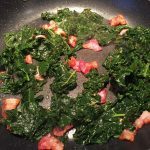 While bacon is cooking, wash kale, remove stems and coarsely chop the leaves (or just tear the leaves into pieces away from the stems). 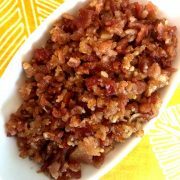 When bacon is done cooking, add chopped kale and minced garlic and mix until combined. Cook, stirring every 30 seconds, until kale is wilted and cooked through (about 5 minutes). Add salt and pepper to taste. 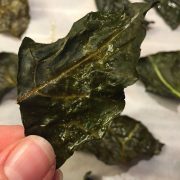 Crispy Baked Kale Chips Recipe - Healthy & Crunchy!